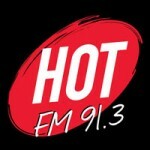 Hot FM 91.3 is one of the most popular radio stations in Singapore. You will hear the greatest songs of the moment. The station is locate in Toa Payoh New Town, Singapore. Don't miss all the music that Hot FM offers.